A form of judicial trial wherein supernatural aid was invoked in place of evidence; an appeal to the immediate judgment of God. The ordeal (Anglo-Saxon, "ordel" = "judgment") was widely disseminated among the Aryan peoples. It still flourishes among the Indians, and it continues to live also in the superstitious imaginations of the peoples of Europe. During the Middle Ages it was sanctioned by both church and state; indeed, special liturgical formularies were drawn up for its application. In those dark centuries this absurd ceremony, variously termed trial by the cross, the communion, fire, water, etc., took the form of actual orgies (Patetta," Le Ordalie," 1890; Rocca, "I Giudizi di Dio," 1904; Herzog - Hauck, "Real - Encyc." vii. 33-35; Meyer, "Der Aberglaube des Mittelalters," p. 230, and elsewhere; Wuttke, "Deutsche Aberglaube," Index). The "judicium Dei" was encountered not only among the Aryans, but also among other peoples (see Tylor, "Primitive Culture," Index; an example from New York is given in the German ed. i. 85); and traces of it are to be found in the history of ancient Israel and of its descendants, the Jewish people. Some maintain that an ordeal is referred to in Ex. xxii. 8, 10. More correct would it be to regardthe curse which makes a thief confess (Judges xvii. 2; comp. Lev. v. 1) as some form of ordeal, as ordeals generally were employed for the discovery of thieves (comp. sieve and shears oracle in Tylor, l.c. German ed., i. 127; praying in the words of Ps. xvi. and cix. to this end in Meyer, l.c. ; Wuttke, l.c. § 307). However, the real characteristics of the ordeal are manifest only in the method practised in the case of the woman suspected of adultery, described in Num. v. 11-31 (see Jew. Encyc. i. 217b, s.v. Adultery). This form of ordeal was actually practised (Ber. 63a and parallels). The chiefs of the Sanhedrin administered the bitter water to female proselytes and liberated female slaves also ('Eduy. v. 6 and parallels); a separate place in the Temple, the doorway of the gate of Nicanor, was designated for the trial (Soṭah i. 5); and it was held in public (ib. 8). The characteristics of the ordeal are manifested in its twofold nature: (1) it was efficacious only when the husband was innocent, acting simultaneously upon the adulterer and the guilty woman (ib. ix. 9 and Gemara 47b); and (2) it was applied in doubtful cases only, hence purely as evidence, and solely at the request of the husband (ib. iii. 6, iv. 2). It was suspended by Johanan ben Zakkai (60-70), because adulterers became too numerous and it hence lost its ordeal character (ib. ix. 4). 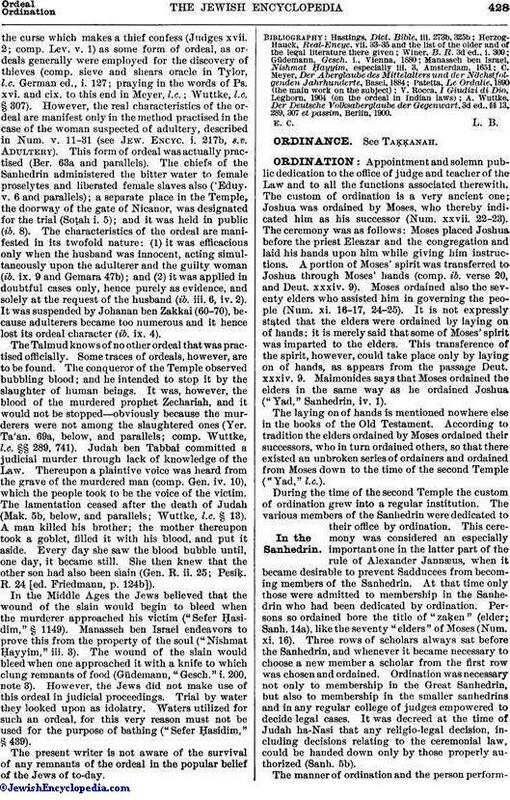 The Talmud knows of no other ordeal that was practised officially. Some traces of ordeals, however, are to be found. The conqueror of the Temple observed bubbling blood; and he intended to stop it by the slaughter of human beings. It was, however, the blood of the murdered prophet Zechariah, and it would not be stopped—obviously because the murderers were not among the slaughtered ones (Yer. Ta'an. 69a, below, and parallels; comp. Wuttke, l.c. §§ 289, 741). Judah ben Tabbai committed a judicial murder through lack of knowledge of the Law. Thereupon a plaintive voice was heard from the grave of the murdered man (comp. Gen. iv. 10), which the people took to be the voice of the victim. The lamentation ceased after the death of Judah (Mak. 5b, below, and parallels; Wuttke, l.c. § 13). A man killed his brother; the mother thereupon took a goblet, filled it with his blood, and put it aside. Every day she saw the blood bubble until, one day, it became still. She then knew that the other son had also been slain (Gen. R. ii. 25; Pesiḳ. R. 24 [ed. Friedmann, p. 124b]). In the Middle Ages the Jews believed that the wound of the slain would begin to bleed when the murderer approached his victim ("Sefer Ḥasidim," § 1149). Manasseh ben Israel endeavors to prove this from the property of the soul ("Nishmat Ḥayyim," iii. 3). The wound of the slain would bleed when one approached it with a knife to which clung remnants of food (Güdemann, "Gesch." i. 200, note 3). 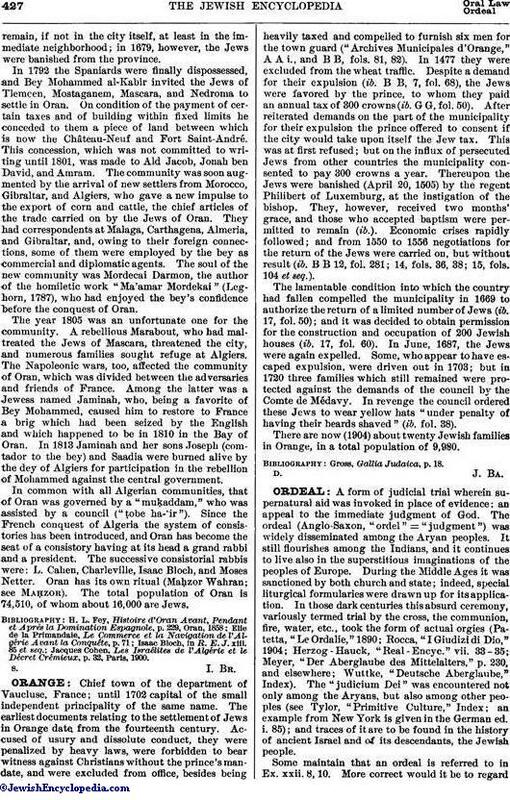 However, the Jews did not make use of this ordeal in judicial proceedings. Trial by water they looked upon as idolatry. Waters utilized for such an ordeal, for this very reason must not be used for the purpose of bathing ("Sefer Ḥasidim," § 439). The present writer is not aware of the survival of any remnants of the ordeal in the popular belief of the Jews of to-day. A. Wuttke, Der Deutsche Volksaberglaube der Gegenwart, 3d ed., §§ 13, 289, 307 et passim, Berlin, 1900.